Is the turbo-powered King Cat a smart move from Arctic Cat? The unveiling of the 2017 M9000 Arctic Cat King Cat strikes us as very interesting. In our review on Yamaha’s 2017 SR Viper M-TX SE, we came down somewhat hard on Yamaha for sticking with exclusive four stroke power for its mountain snowmobiles, thus in turn, producing heavy snowmobiles. We also threw a few jabs at the Sidewinder M-TX SE for same matter. Recently, we presented our thoughts about Arctic Cat and its mountain program, the good, the bad, the ugly, the beautiful and all blemishes and beauty marks in between. The question then, is the M9000 a smart move for Arctic Cat? Yes. Truly, the King Cat will be heavy, that is fact from a turbocharged four-stroke motor. But, with the M9000 built on the cinched-in, smoothed-out and narrowed-up Mountain Cat ProClimb chassis, this turbo 162 should be properly set for some boondocking, for those who are willing and adventurous. We are. Are you? The Mountain Cat is narrowed-up, call it cinched in at the waist, to challenge the narrow mountain snowmobiles from the other manufacturers. The MC is silky smooth in the pow pow. Our review on the 2017 Sidewinder M-TX from Yamaha’s trove was fairly positive, from a mechanical and engineering perspective, but we could not, and cannot, ignore the fact it is heavy. However, the Sidewinder M-TX from Yamaha, as well as Arctic Cat’s other “9000” trail and crossover snowmobiles, are well-built and sweet functioning snowmobiles. Back to “the question lies” question with a second answer: Arctic Cat had an M9000 before, and it was, well, fun, within its small boondocking envelope. 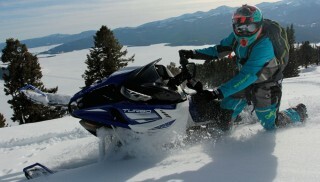 In fact, we never saw one in the backcountry, ours was the only one, which Arctic Cat loaned to us. This yesteryear ProClimb M9000 with its turbocharged Suzuki motor was stout, but not like this Yamaha turbo the King Cat uses. Here is our last review on the M9000, which was the 2014 model. In short, the last M9000 turbo 162 (model year 2014) was twin-cylinder, four-stroke Suzuki motor with its turbocharger operating at a maximum boost of 9 psi. The motor had a bore and stroke of 98 x 70 mm, its intake was a single wide-mouth 46mm throttle body unit. Horsepower was 177 regardless of elevation and temperature. The 2014 M9000 Limited 162 relied on a Suzuki turbocharged twin to make the ponies. It was handful, in that, it was fun, but heavy in the handlebars; 2014 was the last year for the turbo Suzuki. For the Yamaha motor inside the King Cat, its differences are vast; it is a three-cylinder, four-stroke high-performance 998cc with three 41mm throttle bodies. Horsepower is a claimed 180 to 185 with 120 to 125 foot pounds of torque. So, one more cylinder and two more throttle bodies and from that, only three to eight horsepower more. But, we hear and have read, the Yamaha motor is more than likely going to make approximately 205 horsepower; that about 28 horsepower more than the Suzuki-powered M9000 Limited and Sno Pro from 2014. DynoTech Research, Batavia, New York, placed a pre-production 998 turbo on its dyno and the numbers that rolled off the dyno unit read 204 horses and approximately 125 foot pounds torque. The motor had 800 miles on it. The 2017 King Cat, with its horsepower and torque should – we hope and want – prove to us, the media, and to you, the mountain snowmobile public, how good – how nimble and agile – the Mountain Cat ProClimb chassis is. We believe, and with no seat time at all on the King Cat, this will be a fairly nimble snowmobile for its class; we assume it will be more nimble than the Sidewinder M-TX. How different handling than the Sidewinder M-TX? The 1M 900 King Cat 162 set the tradition for the “King Cat’ name plate, this twin cylinder two stroke 900 was light for its class, and at the time, the lightest 800- and 900-class mountain snowmobile. In its time, this was the standard. First, the driveshaft is lower by 1.125 inches, which gives it a flatter track-to-snow approach angle. Second, the King’s runningboards are cinched in on each side by one inch, resulting in an overall runningboard tightening by two inches. This improves sidehilling performance. Third, it has a narrowed-in belly pan and shape, which allows the rider’s feet to move two inches further forward for increased options for foot placement; the belly pan at the lower side panels is rolled and pulled in to match the narrowed-in runningboards. These three differences should give the King the nimbleness Cat wants it customers to experience. Not to end to here, the King Cat, like the Mountain Cat, relies on Team clutches to harness the 998’s power and throw said power to the PowerClaw track, which is a 162 with three-inch lugs. Lastly, from the press releases, we are mesmerized by how good looking the King Cat is; like, “Wow,” good looking. 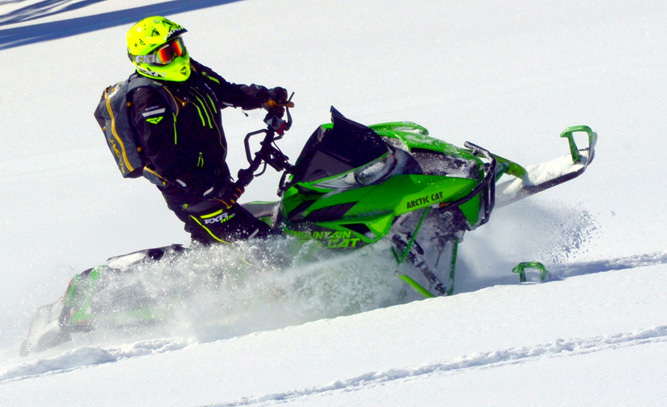 When we played on Arctic Cat’s prototype snowmobiles this past early February near Island Park, Idaho, we were impressed with the Mountain Cat and its many much needed refinements. It is a quick chassis….nimble to say the least. 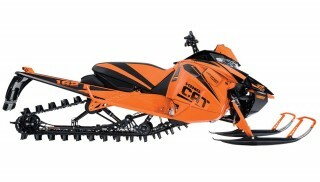 While we are eager to see how the new King Cat handles, we can say with confidence that this is one nice looking sled. At the Arctic Cat sneak peek came to, a new Thundercat that Arctic Cat raved about with its new turbo motor jointly developed with Yamaha, with Yamaha the lead project company. Arctic Cat was also very proud of its XF 9000 Cross Country with same Yamaha power. We rode this turbo Cats and loved the quiet and sneaky Millennial Falcon fast they were, and are. At model year 2017 Photoshoot, West Yellowstone, Mont., March 2017, the same M8000s, Mountain Cats, M6000s, XFs and Thundercats were present; those we rode three weeks prior. We sat in the technical session, learned about other refinements and began riding the mountain and crossover snowmobiles from Arctic Cat. Arctic Cat led us to believe the big turbo was reserved for the Thundercat and the XF line. We did not question, we did not point at Yamaha and its turbocharged Sidewinder M-TX and say, “but, but…” After all, the M7000 Sno Pro was no longer in Cat’s cache of winter mountain goods, so we left after five days of riding believing Cat was all about two-stroke power. Then Hay Days. Then a press release. King Cat. Orange. Menacing. We have no experience on the King Cat 162. We only can give a glimpse of how it will perform on the snow after riding the competition’s and cousin’s Yamaha Sidewinder M-TX SE. First, after reading the spec sheet, it became clear Arctic Cat reserved its best narrowed-in and cinched-up chassis for the King Cat, the same ProClimb used on the Mountain Cat. With lower side panels tucked in, runningboards narrowed, chaincase dropped and rolled, and toe wells opened up, the King Cat is all high end Mountain Cat with one exception, a 180-horsepower (conservative speaking) four-stroke mountain snowmobile that is all about climbing high, climbing high and climbing high. This snowmobile is not for everyone. In fact, that’s an elementary statement. 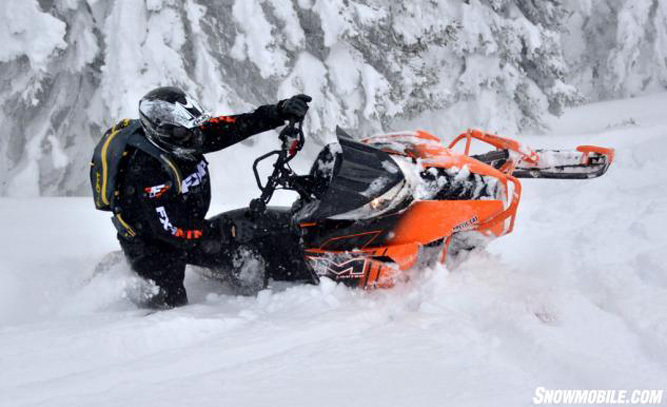 Not every snowmobile is made for every rider and riding style. The King Cat is not meant for the tight tree line, pick-your-line, tree-picker. Though we surmise this being the ProClimb Mountain Cat chassis, it will behave nicely in the trees. But, understand, with four stroke power, turbocharging, additionally wiring, coolant plumbing and exhaust gas wizardry comes weight. This will be a heavy snowmobile, but we hope (surmise) its horsepower (and torque) to weight ratio will give it a lighter-than-what-it-is feel. 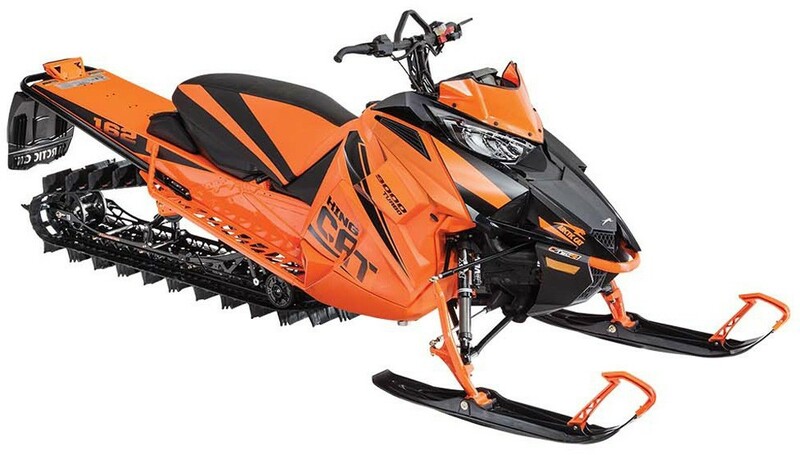 We already have a deep fondness for the “King Cat.” When Cat released its original King Cat on the 1M chassis, a 900cc mountain snowmobile, in either a bold orange King Cat, or black King Cat with green accents, we could not get enough of it. In fact, this author, way back then, raced for Arctic Cat on the hillclimbing circuit, and the King Cat was unbelievably nimble at the time, and powerful. We are excited and we hope to pair the King Cat and Sidewinder M-TX SE against each other. Stay tuned.